Dr. Valbuena was born and raised in Savannah and is a graduate of Savannah Christian Preparatory School. After high school, Dr. Valbuena earned his Bachelor of Science at Clemson University. He is a proud graduate of Ohio College of Podiatric Medicine, now Kent State University, College of Podiatric Medicine, in Cleveland, Ohio. Dr. Valbuena completed his two-year surgical residency in St. Louis, Missouri. 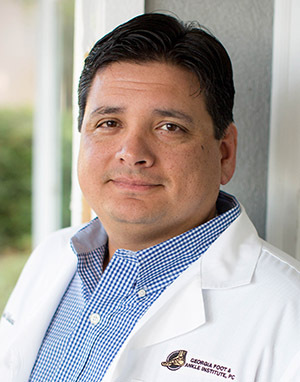 Immediately after residency, Dr. Valbuena returned to his hometown of Savannah and later joined Georgia Foot and Ankle Institute in the summer of 2004. He specializes in all aspects of foot and ankle surgery and reconstruction. His practice interests include foot and ankle surgery, sports medicine, trauma, diabetic foot care, and extensive wound care. Dr. Valbuena is board certified by the American Board of Foot and Ankle Surgery and is a Diplomat of the American College of Foot and Ankle Surgeons. He currently has privileges at Candler Hospital, St. Joseph’s Hospital, and Memorial University Medical Center. Dr. Valbuena is an avid fisherman. He spends most of his free time with his wife, daughter and twin boys.